E-book readers have become a hot item since Amazon released its original Kindle. I purchased a Kindle 2 a while back, as I enjoy reading in my free time. As much I love it, it just didn’t compare to a dead tree version when it came to the versatility of place you can read it. When I was younger, my family had a timeshare out on the beach where I would go every summer. I loved sitting out by the pool and beach reading in the sun. I wouldn’t dare take my kindle poolside for fear of it taking a plunge or getting splashed by some annoying kid. I thought there had to be a better solution. 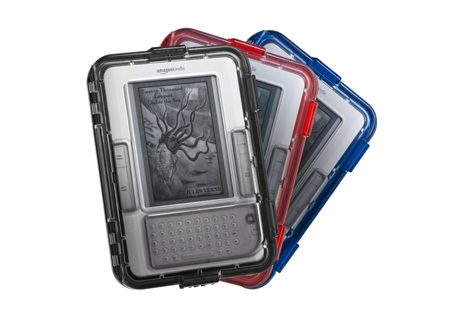 Luckily for me, and other avid readers, M-Edge introduces their Guardian case for the Kindle. So is this case able to survive the trials of the aquatic reader? Lets find out. Includes anti-reflective film to protect case screen and reduce sun-related glare. Ring at the bottom of Case is to attach lanyard (included) for additional device security.